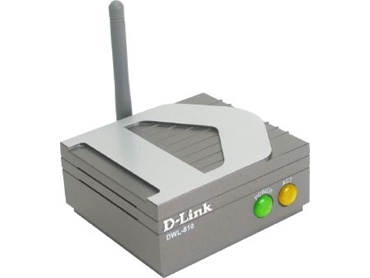 D-LINK has announced a new version of the D-LinkAir DWL-810 Ethernet-to-wireless bridge that adds the ability to connect gaming and entertainment consoles to the internet. The new version of the DWL-810 allows an XBox or PS2 to link up and connect in either ad hoc mode, one console to another console, or infrastructure mode, over the internet or to an 802.11b wireless network with a wireless access point or router. The D-LinkAir DWL-810's integrated web-based interface creates a platform independent device that easily integrates into any system with an Ethernet port. The Ethernet port becomes the 802.11b wireless client, making the Ethernet to wireless bridge the quickest and easiest way for gamers to connect their game consoles and jump into the gaming environment. Wireless connectivity provides the best means for gamers who use the same game console on more than one television or in multiple rooms throughout a home. There is no need to move the internet cable connection when the console is transferred to another location; users simply take the D-LinkAir DWL-810 to the new location, without having to reconfigure it. Downloadable online content and online gaming are the future for next generation gaming consoles, such as the PS2 and the Xbox, and the DWL-810 device to enables the connections. The D-LinkAir DWL-810 strictly adheres to the latest IEEE 802.11b specification for high-speed wireless networks and the IEEE 802.3 specifications for Ethernet wired networks. It operates in the 2.4GHz frequency range and uses direct sequence spread spectrum (DSSS) modulation technology.